Council President Wesson, Members of the City Council. Our great city Commissioners, Department Heads, and my fellow City Employees. Community leaders and distinguished guests. My mother, my family — especially my wife and partner, Amy Elaine Wakeland. To my friend, President Dianne Harrison, and the entire CSUN family, thank you for welcoming us so warmly to this world class university. Let’s think about where we are for a moment. 21 years ago, the Northridge earthquake shook this place and our city to its very foundation. Here at CSUN each of the 107 buildings on campus was damaged. Some wondered if life would ever be the same. But this is Los Angeles. We have an unshakable optimism. And we know how to put it to work. But in just one month. Reborn as a global center of innovation. Today, CSUN leads the state in training new teachers; it’s a cradle of creativity, where the next generation of filmmakers and musicians explore their art. Just look around. In this space, you can feel the unstoppable spirit of this university and our city. 21 years ago, this campus was in ruins. And 21 months ago, when I raised my hand and took the oath to become your mayor, our city was still reeling from the Great Recession. Unemployment was over eleven percent… and City Hall was looking down the barrel of a billion dollar deficit. The city had stopped fixing sidewalks, trimming trees, and hiring firefighters. When I took that oath, I told you that I would get us back to the basics. I said that it was time for City Hall to improve core city services, to rebuild our city’s infrastructure and to help businesses create more middle-class jobs. 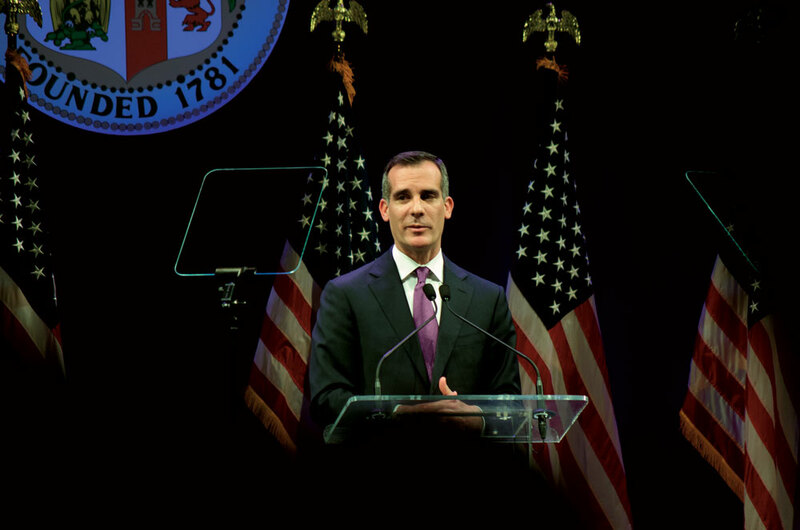 And today, we’re leaving the recession in the rearview mirror…and building a Los Angeles that works. And more people are choosing to live, work, visit, and study in L.A. than ever before. Today, I am proud to report to you that our back-to-basics agenda is delivering results. Los Angeles and your City Hall are roaring back, and the state of our city is strong. You can see it across Los Angeles — from the cranes soaring over Downtown and Warner Center, to the new rail lines that are being laid on Crenshaw, and west to the Pacific. You can see it in once-empty storefronts — from Mar Vista to Highland Park– filled with new businesses and new energy. Los Angeles is experiencing tremendous forward momentum. But our city cannot maintain that momentum on its own. And second, our city must work for all Angelenos–in every neighborhood, in every corner of our great city. Meeting this challenge begins on our streets. Earlier this year, I went to Boyle Heights to meet with parents at the Oscar de la Hoya Animo school. I expected to hear about the state curriculum, testing, and graduation rates. Instead, I heard about trash. Parents told me they were fed up with their kids walking to school on dirty streets lined with broken TVs and abandoned couches. They weren’t alone. I’ve heard this all across the city. Right now, the city has just one thousand trash cans on our streets. We will add five thousand new trash cans over the next four years — allowing us to pick up an additional ten thousand tons of trash … enough to fill an entire ten-story building … every year. We’re deploying an additional Strike Team to pick up more abandoned waste in our neighborhoods. We’ll issue cleanliness grades across the city, street by street, share those reports with the public, and use those assessments to target hot spots. Clean streets and great streets must also be safe streets. We should all be very proud: we reduced overall crime at the end of last year to its lowest level per capita since 1949. But our city’s violent crime numbers were up. And as long as I’m your Mayor, I won’t duck bad news. I’m going to own it and I’m going to attack it. First, we’re nearly doubling the ranks of LAPD’s elite Metropolitan Division, so we can quickly saturate a neighborhood with additional officers when crime spikes. Second, because domestic violence increased in our city last year, we’re also doubling the number of our Domestic Abuse Response Teams so there’s one in every LAPD division — and today, I am proud to announce that they will be on the streets by July first, six months ahead of schedule. DART teams are civilians who roll out with police officers and give victims of domestic abuse the legal, medical, and emotional support they need to break the cycle of violence. Third, we know that intervention works …when our Gang Reduction and Youth Development workers step in, guns are lowered and lives are saved. Today, I’m pleased to share that the budget that I’m sending City Council next week will include five point five million dollars more for the GRYD program, so we can cover new territory and 50 percent more gang-related violent crime. Fourth, we’re investing more in prevention. Marquon Thornton grew up in public housing — in Nickerson Gardens, in Watts. Growing up, there wasn’t a safe place for him to play. I remember hearing him describe the raw heat of a bullet that just missed him in his neighborhood gymnasium as a kid. But when Summer Night Lights — a program I’m proud to have helped start — came to his neighborhood, Marquon got a job working at a city park. He got promoted and became a Peace Ambassador with the GRYD Watts team–even attending college right here at CSUN. And today, as a program coordinator for Summer Night Lights, Marquon shoots baskets with kids in the same gymnasium where he dodged that bullet. Los Angeles needs more success stories like Marquon’s, which is why I am announcing that we are expanding Summer Night Lights beyond the summer, to cover Friday nights during the school year in key parks. Because crime doesn’t end when the school year begins. When cops and community members don’t know each other — crime thrives. This is the heart of our approach to tackling crime, which we call relationship-based policing. In the aftermath of Ferguson, Staten Island, and now, North Charleston, relationship-based policing has put us on track to be the biggest city in America to put body cameras on every officer on the street. Relationship-based policing means that we are expanding our nationally-recognized Community Safety Partnership — which places officers in specific public housing developments for five-year stints, where they become a part of the community they protect and serve. These officers don’t just patrol the streets, they help kids get to school safely, they coach their football teams, and they teach them leadership and conflict resolution. And today, with Chief Charlie Beck, I am announcing the creation of a new division at LAPD that centers on relationship-based policing — the Community Policing Division — 40 officers whose sole mission will be to build even greater trust and partnerships in our communities. Your safety is my highest priority. And that means making sure that when you need help, you get it fast. From day one, I focused my administration on reducing emergency response times. With Chief Terrazas, we started hiring firefighters again. When we looked into our 911 call center, we discovered that it was standard practice for dispatchers to ask a long series of questions before they sent an ambulance. So we put a stop to it. Now, we send the ambulance, then finish the survey. And we’re seeing results — call processing times are down by 18 seconds in the first quarter of this year, which can be the difference between lives saved and lives lost. By focusing on the basics, I am working to improve your everyday life in Los Angeles as well. Take our transportation needs. Here in L.A., we’re leading the nation’s largest public works project — five new rail lines and bus improvements to drive our economy forward and get us out of our cars and home in time for dinner. This funding is accelerating subway construction under Wilshire Boulevard. As a result, we’ll be able to ride underground from Downtown to Century City a year earlier. We see Angelenos at work, building the new Crenshaw/LAX Line, the Downtown Rail Connector, the Gold Line Extension, and the Expo line extension, which will connect the east side to the ocean when it opens next year. And in recent months, we dedicated two new rapid bus lines that will connect the Valley to the Westside… and Downtown to UCLA, saving fifteen to thirty minutes from your daily commute. We are testing cutting-edge technology at the Port of Los Angeles, building some of the most advanced terminals in the world, refurbishing our Ports-of-Call gateway next to the USS Iowa, and launching an historic partnership with the Port of Long Beach to share equipment, to innovate, and to protect our environment together. LAX is one of our country’s major economic hubs, but our beautiful new Tom Bradley Terminal, the nicest in the nation, sits next to some of the worst terminals in America. So as mayor, I have launched the nation’s largest airport construction program to redo the entire airport, rebuilding eight more terminals and adding a new international terminal. And, most importantly, we’re finally — finally — connecting rail to LAX. My trade trips have helped us land more than a dozen new daily international flights, each representing hundreds of millions of dollars and thousands of jobs for our local economy. When I was growing up, there just was one non-stop flight a week from LA to China. We now have forty-four, more than any other city in the United States! It isn’t just where we go from LAX, it’s how we get to LAX. Whether it is your daily commute, or getting to and from the airport, we have to make navigating this city more convenient for our residents. So today, I’m announcing that by this summer, at my direction, ride-share companies like UBER and LYFT will be able to pick you up at the airport. And to help you get anywhere that you want to go in L.A., I am announcing the launch of a new data-sharing partnership with the traffic app Waze–the biggest collaboration of its kind. And we will use the data collected by these apps to find new ways to cut your commute. Today we are ranked the Number One Digital City in America, something we never would have imagined just a couple of years ago. We’re finally moving our Sanitation truck drivers from Thomas Guides to tablets — something our own Sanitation workers suggested after my administration began meeting with city workers to hear their ideas. To support city workers that show this kind of creativity, I even established the Civic Innovation Award. Let me tell you about one of our winners, John Tosto, a surveyor in our Bureau of Engineering. He was in charge of placing the mile markers on a resurgent L.A. River bike path. Doing it the old way would have taken three people with heavy equipment and two weeks to complete in the summer heat. Instead, John applied ingenuity and common sense. Using his smartphone, Google Earth, and his bicycle, he got the job done by himself in just two days, saving tens of thousands of dollars and changing the way we can survey citywide — allowing us to save even more money and deliver better service to the people of L.A.
John, your creativity is at the heart of our city’s spirit and economy. You are who we are: innovators, risk takers, storytellers. And here in L.A., the entertainment industry is a bedrock of our middle class. I told you last year that I would make expanding California’s film tax credit my top priority in Sacramento. And I delivered — a one point six billion dollar tax credit that will create 50,000 jobs. And I want to thank our partners in Sacramento who helped us get the deal done, like Senate President Pro Tem Kevin de Leon and the coalition of statewide mayors that I led. I brought that same focus and collaboration to our port dispute earlier this year, where I jumped in and worked with my fellow West Coast Mayors and the White House to hammer out a deal and get billions of dollars of cargo moving again. When the railcar manufacturer Kinkisharyo threatened to move out of state, we worked day and night at my office at City Hall to keep them from leaving, and now the rail cars on the Crenshaw, Expo, and Gold Lines will be made here. We competed for and won fifty eight million dollars in competitive federal funding for advanced manufacturing and aerospace. And today, Los Angeles has more high-tech jobs than any county in the nation — more than New York, Boston, and even Santa Clara County in the heart of Silicon Valley. In my inaugural speech, I said that City Hall was for too long known as a place where jobs went to die. Today, City Hall is a full partner in our economy’s success. Take the case of TIG/M, a Chatsworth company founded by a couple of film industry vets who wanted to build beautiful trolleys and streetcars. They had early success and even designed the trolley at the Grove, the one that my 3-year-old daughter asks to ride just about every day. But they didn’t rest on their laurels. TIG/M kept innovating. They engineered and built the world’s first hydrogen-powered, zero-emission trolley. When they sought to take this LA innovation and compete globally, they came to my office, and we gave them the help they needed to win contracts around the world in places like Qatar, where they are installing an entire green trolley system. TIG/M’s success is our success — it brings together green innovation and imagination, and shows that L.A. companies can compete and win anywhere. And as TIG/M grew, it also doubled its workforce…and they’re poised to double it again. 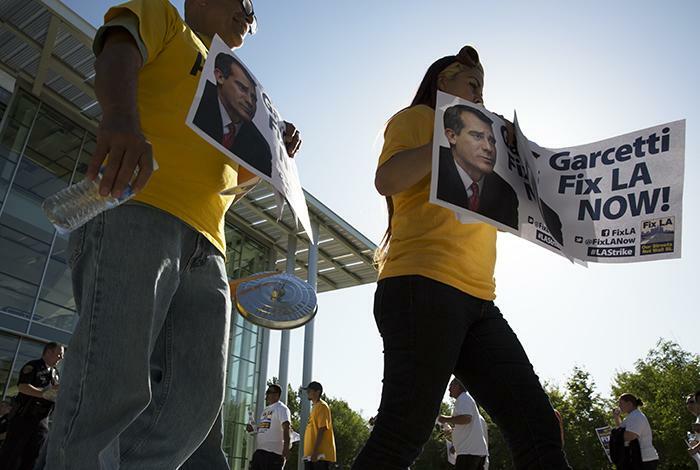 But continuing high taxes and low wages threaten L.A.’s economic momentum. That’s why I made it a priority to cut our business tax, and extend our tax break for Internet-based businesses, to ensure L.A. attracts the best jobs of the future. Yahoo told us this is why they chose to move into our city. It enticed investment giant Oaktree Capital to renew its lease and stay in L.A.
And eHarmony discovered they were most compatible with our city, and moved 200 jobs to L.A. because of our tax cuts. I want to thank the City Council for supporting the steps we’ve taken to reduce our City’s business tax so far. These cuts were just a down payment during hard times. When times are better, we are going to push even further. Let’s lay to rest the myth that you must be either pro-business or pro-worker. High taxes and low wages conspire to chase businesses away and depress our spending power. We must address both. Today, one million of our fellow Angelenos live in poverty. Taken together, they would be one of America’s ten largest cities. That’s why I am calling on the City Council to pass a responsible, carefully crafted plan to raise the minimum wage — now. Angelenos can’t wait. No one should be forced to choose between paying rent and buying groceries. LA’s poverty costs us all–in food stamps, emergency room visits, and after-school programs to provide homework help when parents aren’t around. Our economy does best when everyone can afford to spend into it, instead of being subsidized by it. So let’s raise the wage, L.A.! Even with a good wage, we’re still the least affordable housing market in the country. It’s why I set the goal of building one hundred thousand units of housing by 2021…. It’s why I’m fighting so hard in Sacramento and Washington to replace housing funds that were stripped away in recent years. But we’re not going to wait for Sacramento or Washington. I’m announcing today that my budget includes an additional ten million dollars for the Affordable Housing Trust Fund. Half of this money is being generated because, for the first time, we will collect taxes from Airbnb. And today I call on our state legislators to support Speaker Toni Atkins’ plan to increase tax credits and funding for affordable housing this year. If L.A. can lead the way in tough times, it should inspire California to do the same. Our city is working again, but we must ensure it works for all Angelenos. Today, we have an opportunity to boost our economy by three billion dollars by bringing 250,000 Angelenos out of the shadows and making them a legitimate part of our economy. We have always been a city of immigrants. Nearly 60 percent of us are immigrants or the children of immigrants. When we exclude immigrants from contributing, creating, and innovating, we waste our city’s potential. That’s why I led mayors across the country in going to court to fight for President Obama’s executive order on immigration. We have an historic opportunity to help our city. That’s why I have launched “Step Forward L.A.”, a partnership with the city, county, business and philanthropy to help one hundred thousand hard-working Angelenos work legally in this city by the end of my first term as mayor. And we’ve already raised four million dollars to advance that goal. By going back to the basics, we are doing big things. We’ve cut veterans’ homelessness in half, and by the end of the year we will end veterans homelessness in Los Angeles. We more than doubled the number of summer youth jobs in our City…so nearly eleven thousand young people will have a shot at a great future. We appointed a majority of women as city commissioners for the first time and we commissioned the first-ever study on the status of women in Los Angeles…to get the hard facts we need to close the wage gap. We secured funds for a new LAUSD initiative to provide every conceivable support to 5,300 sixth and seventh graders through their first year in college to make sure they are firmly on track for success — as many sixth and seventh graders as there are in the entire city of Boston. We designed new parking signs you can actually understand — so you can get to where you want to go, instead of getting a ticket! We even wrote a new ending for the movie Chinatown — we ended a hundred year war with the Owens Valley that was costing L.A.’s ratepayers millions of gallons of precious water in the midst of a drought…. We have the highest recycling rate and the most solar power of any city in America…and just last week we issued the country’s most comprehensive sustainability plan. We’re hosting the Special Olympics this summer. We’re saving more shelter animals than ever before. And we’ve reduced our 311 wait times 84 percent. Each of these successes is important. Together, they are the story of a new L.A — one that’s focused on the basics and believes in itself again. But none of our successes matter unless we address the fundamental threats that could determine whether our city even has a future. One hundred years ago, this city’s visionaries imagined a future possible only with plentiful water. So they engineered an unprecedented system to bring us the water that made L.A. a great metropolis. Today, during this historic drought, we will once again reimagine our relationship with water to ensure that our city continues to thrive. One hundred years ago, water was a challenge for engineers. Today, it’s a challenge for all of us. Government will lead, but every Angeleno must do their part and be conscientious of their consumption. Last fall, I issued an aggressive Executive Directive to cut L.A.’s water use by twenty percent. I directed our city departments to lead by example — by cutting back on watering, using more recycled water, and planting drought tolerant gardens. And we increased incentives for Angelenos to take action: free rain barrels, rebates for smart sprinklers, and most significantly, we’ll pay you three dollars and seventy five cents per square foot to replace your lawn with drought-tolerant plants. A few weeks ago, Governor Brown called for the removal of fifty million square feet of lawn in California. Governor, today I can report that with only ten percent of the state’s population, Los Angeles will reach half of your entire statewide goal by the end of this year. Angelenos never let a good crisis go to waste…we’re even using this drought to create jobs. For example, Turf Terminators is an L.A. company that leverages rebates to replace water-guzzling lawns with beautiful, water-wise plants – like the ones you see on this stage – for free! The company started with just 3 people last July. Now it employs more than 450. These are some of the thousands of new, green jobs that have bloomed since I became mayor. So tear up that turf, Los Angeles! Don’t let the sink run. We‘ll get through this drought because we are a resilient city…a city that prepares for disasters, instead of being caught off guard. The Northridge quake shook the earth for seven seconds. The next one–the Big One–could shake the earth for two minutes. I hope this earthquake will not happen during my time as Mayor, and God willing, not in our lifetimes at all. But it will happen; it’s overdue. My administration brought in Dr. Lucy Jones, one of the world’s foremost seismologists, and she put in a full year of work at City Hall. Our report, called Resilience by Design, is a plan …of …action. It is the most aggressive earthquake plan in the nation’s history. It will save buildings and more importantly, save lives. And the City Council and I are implementing it now. 21 months ago, when I took office, I told you that back to basics would lead to a bold future. Here in the Valley and across this great city, we see that promise. Working in partnership with my Council colleagues — under the extraordinary leadership of my friend, City Council President Herb Wesson — City Hall is getting things done. Neighborhoods are on the move. People are getting back to work. We are again a city of believers, who see a better day and a better way around each corner. That belief is borne from the places we call home–the quiet pockets of our city where we gather with our friends at a neighborhood cafe, with our children at a nearby park, or with our fellow worshippers in one of our city’s holy spaces. That belief in our city is handed down from generation to generation. My great-grandparents and grandparents fled wars, crossed rivers and oceans to settle on our city’s Eastside, where they learned to believe in L.A. They passed on that spirit to my mother and father as they raised their families in Central, South, and West Los Angeles. And my parents, in turn, passed that spirit on to me, growing up here in this San Fernando Valley. The Valley is a microcosm of our city and its values: the place where the Brady Bunch was filmed, a diverse cross-section of great neighborhoods and great places to work, where young people are starting companies in their garages, kids are cruising the bike lanes, and fruit trees still grow in backyards. Here in the Valley, Angelenos designed and built engines that put men on the moon. When Steven Spielberg wanted to welcome an extraterrestrial to earth, he could have picked anywhere. But he chose Granada Hills. The Valley is as much the home of the American dream as anywhere—a place where it doesn’t matter where you came from, only where you want to go. I love being your mayor. And I believe in LA. I love that I am speaking to you here … I grew up driving by the sign here on Nordhoff that reads CSUN in two different directions—no matter which way I was headed, I knew I was home. I love leading the MTA in a city where I rode the bus home from school everyday–or to the Galleria, to get a hot dog on a stick. I loved designating Van Nuys Boulevard as one of our Great Streets, because it’s the same street I walked with my grandmother to buy ingredients for her Sunday menudo. I love Los Angeles. The possibility this city offers has always made a believer out of me. From the Harbor to Hollywood. From Watts to Venice Beach. Because we believe in L.A…what it represents…and what we will achieve together.